1 day: arrival in Ohrid. Accomodation in 3 or 4 stars hotel. Optional dinner in a local restaurant. Night. 2 day: Ohrid. Free time. Optional tour of Ohrid afternoon: the square of the town, the port, the churches "St. John Kaneo", "St. Panteleymon", fortress of tsar Samuil, the church "St. Bogorodica"- XII century, the Amphytheatre, the church "St. Sofia". Official dinner. Night. 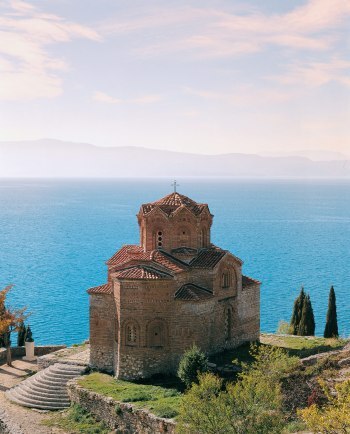 3 day: Ohrid-„St. Naum” monastery-Struga-Ohrid. In the morning - departure for „St. Naum” monastery. Visit of Bilyana's springs, the church :St. Arhangel Mihail and Gavrail", free time. Departure for Struga. Visit of the home of Brothers Miladinovi, the start of Crni Drin river, Visit of the women's monastery "St. Bogorodica Kalishka"in Kalishte village. Late afternoon - return to Ohrid. Free time. Optional dinner in local restaurant. 4 day: Ohrid-Skopie. Departure to Skopie. City tour: "Makedonia" square, the Golden market, the church "St. Kl. Ohridski", "Varosha", the fortres "Skopsko kale", yhe church "St. Spas". Departure.